Preheat oven to 350°F. Melt 1 tbsp butter and brush over the cut side of squash. Add enough water to cover the bottom of a large pan, place squash cut side up in pan and bake for 30-35 minutes, or until tender. Meanwhile, heat remaining butter in a pan and cook until golden brown and fragrant (it will smell nutty). Add onion, celery and apple, and sauté until lightly brown and softened, about 15 minutes. Add sage and thyme, and sauté 3 minutes more. Remove from heat. In a medium bowl, whisk together, stock and pepper. Add stuffing mix, apple and vegetable-herb mixture, raisins and walnuts, and stir to combine. Allow mix to soak until moist (add more stock if necessary), about 5 minutes, tossing intermittently. Set aside. 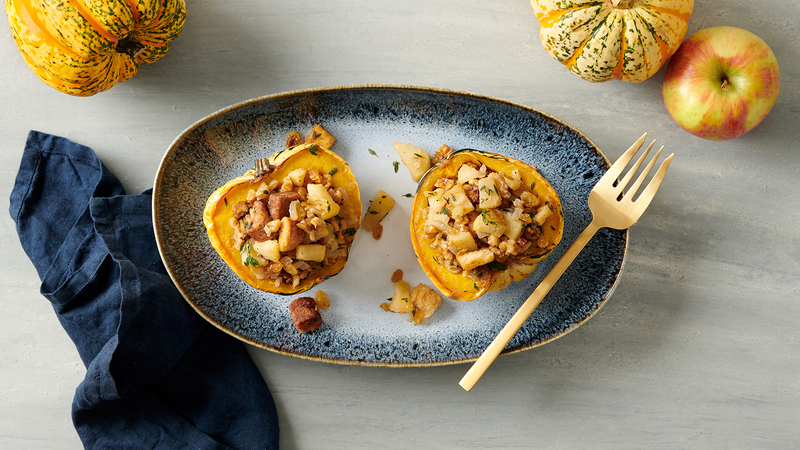 Spoon stuffing into squash cavities and bake 15-20 minutes more, adding more water to the pan if necessary.